Educating and advising on security of motorcycles and regular checks for stolen machines and parts. The “Shiny Side Up” campaign, launched in 2002, is based in the East Midlands and consists of police, road safety and collision investigation professionals. The name reflects a bikers’ saying about the need to keep the tyre firmly on the road. The campaign is designed to persuade sports bike riders, who figure predominantly in the region’s collision statistics, to examine their own attitudes and behaviour. Emphasis is currently placed on installing signs in order to warn motorcyclists on approach of bends where recorded crashes have occurred and to urge all road users to “Think Bike”. The campaign website encourages motorcyclists to report potential/actual collision locations and identifies ‘hotspots’ in their region. Stickers from the “Think Bike” range have also been distributed free of charge. The sticker range (pictured) targets specific issues for their location or alerts against a particular risk. The radio adverts describe the life and loss of a ‘named rider’ killed in a collision. 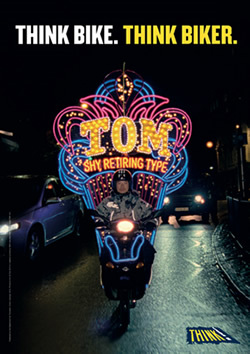 The successful campaign had been re-launched on TV and radio in 2013. “Someone’s Son”, as the name suggests, is a highly humanizing campaign from road safety units across the Yorkshire and Humber region. Its aim is to encourage road users to take care and look out for PTWs, whose riders are almost certainly someone’s son, brother, partner, mother etc. Although developed independently of the “Think! Named Rider” campaign, the campaigns complement each other. National research has shown that drivers can experience ‘inattentional blindness’ when the object the driver is looking at holds no meaning for them. The ‘Someone’s Son’ campaign aims to provide that meaning. Nottinghamshire, Leicestershire and Derby support the Bare Bones project which was created to address a 400% increase in injuries to moped and scooter riders in Nottingham. It is aimed at 16-19 year old moped and scooter riders in urban areas. 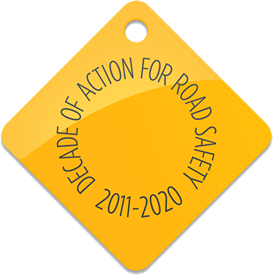 In addition to publicity materials, DVDs and training resources, the website communicates safety messages and emphasises the importance of wearing protective clothing and “the right gear”. The Motorcycle Industry in Europe, ACEM, as part of the framework of the European Road Safety Charter, developed the “Lucky 13” cartoon series. It features a motorcyclist who explains through his clumsy behaviour what to look out for as he rides around the roads and how to avoid the potential risks related to the infrastructure. Each cartoon focuses on a particular risk factor and provides tips to riders on how best to tackle situations including junctions, diesel and liquid spills, night time hazards and outsized central islands. Leicestershire County Council’s bike safety website provides eye-catching diagrams of road-users’ varying reactions to demonstrate the dangers of relying on “blind faith”. Devon County Council’s “Bringing Bikes out of the Blind Spot” programme helped the highway authority to re-engage with bikers, canvass their views, develop skills, focus the work of engineers and designers on motorcyclists’ needs and ensure Devon was seen as a ‘bike friendly’ county. The ‘’Max Rider’’ brand was subsequently developed to act as a bridge between the highway authority, its partners and bikers. It encourages skills development, offers advice and guidance to riders and acts as a portal for reporting highways defects. It also provides Continuing Professional Development for motorcycle instructors. The Max Rider brand is now used by a number of organisations in the UK which provides some consistency on the south west peninsula. Launched in March 2013, REALRIDER® is a smart phone app for motorcyclists that automatically detects if a collision occurs and contacts the emergency services by reference to the user’s last known location. It is the only app on the market that is directly linked to the NHS and has support of the 999/111 Government Liaison Committee. The app also allows riders to record routes and upload them to a dedicated web platform. Pictures, video content, hazard reporting and route-related comments are encouraged to provide RealRider with intelligence on routes in real time. “Brighter Biker” (for 17-24 year olds) which consists of a free three-hour theory session. Students study hazard perception, positioning and statistical information on collisions to emphasise the vulnerability of riders on the road. In addition, they learn about hazards on motorways, rural and urban roads to increase understanding of speeds. Buying the right size machine, basic maintenance, correct clothing to minimise injury and insurance is also covered. After examining compulsory basic training with appropriate interactive videos, the students receive a voucher to book the CBT with the named provider. “Better Biker” (for more experienced riders) presented by a Road Safety Officer, a representative from The Advanced Institute of Motorists and practical Bike Safe training; and Joint On-Road Operations with Metropolitan Police and RSO to pull riders over and advise them on high visibility clothing and training opportunities. Joint On-Road Operations with Metropolitan Police and RSO to pull riders over and advise them on high visibility clothing and training opportunities. Another PMRS Award winner, Lothian and Borders Police, launched and ran a unique ‘Around the Corner’ initiative. The scheme was designed to educate and encourage motorcyclists through direct interaction with police motorcyclist. The website features many resources and advice, including a powerful video filmed from a motorcycle as it negotiates rural road corners and encounters dangers. There are clear commercial, social and community benefits to formal and informal gatherings of motorcyclists. Regular large gatherings will present local police forces with both positive opportunities to engage and occasional enforcement challenges. Poole Quay Bike Nights occur weekly and, thanks to a national following, have on occasion attracted up to 3-4,000 people. The event has been running for approximately 20 years. Initially lacking in formal policing or management, as the event grew in popularity so did the complaints and problems with anti social riding. At that time, on average, the event experienced at least 1 death and 5-10 serious injury collisions per year. In partnership with the local council, Dorset Police managed the event and the routes used throughout the county and operated high-visibility ‘marked’ and ‘unmarked’ patrols. This visible but low-key presence has led to Dorset Police being regarded as one of the friendliest host forces of any bike event in the UK. This has been achieved by working with riders through education and interaction. In 2013, the Cambridgeshire & Peterborough Road Safety Partnership (CPRSP) launched a new campaign called “Twist” (That’s why I should Think!) to encourage riders to consider further skills training. TWIST takes a novel and tongue-in-cheek approach to what is a very serious issue; the main element of the campaign is an animation running on Youtube and the TWIST website. Bikewise is an innovative and award-winning initiative for motorcyclists developed to promote road safety and motorcycle security throughout the year including charity rides and an annual show. BikeWise engages with motorcyclists and has, in collaboration with partners, achieved a reduction of 85% in KSI motorcycle collisions and reduced complaints of antisocial behaviour involving motorcyclists by 60%. Every campaign should educate other drivers on the presence and vulnerability of motorcycles. This is especially valuable in urban situations where another driver is often at fault, for example, at priority junctions when the rider is on the main road and the other driver is emerging from the side road. Similarly, any driver or rider training programme run or sponsored by a local authority should include an element of vulnerable road user appreciation.